3 in 1 universal converter. Based on FTDI FT232R chip seen as normal COM port, and two serial converters MAX232 and MAX485. 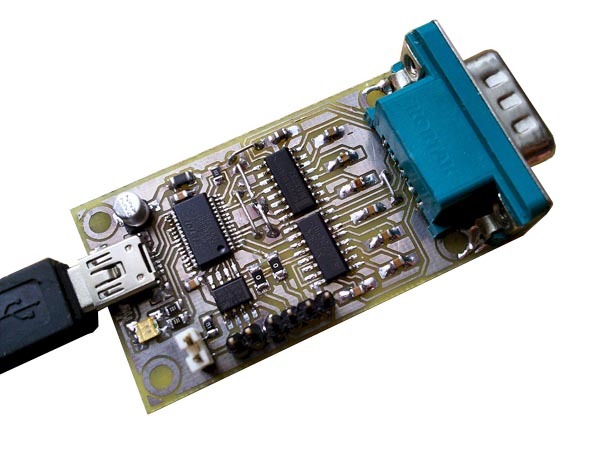 Allow to be used as RS232, RS485, or UAR TTL converter. Connections parameters can be set through the system, as in normal COM port. Supported speeds: 110 to 921600bps. 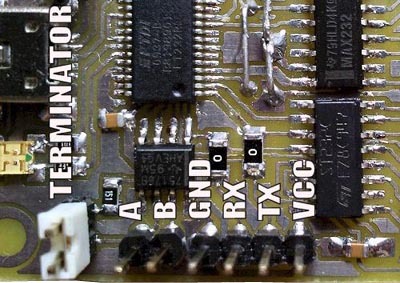 RS232 – Two MAX232 chips are used for TTL – V.24 standard translating. We can use the dedicated MAX211 converter, but its way expensive and unattainable, so i decided to use a cheap MAX232. The only imperfection is that we don’t have the RING line converted, but it is very rarely used for communication. MAX232 chips have build-in +9V -9V voltage converter necessary to ensure V.24 compatibility. RS485 – There’s a RS485 converter chip on board (SN75176). Its transmitter is controlled by TXDEN line from CBUS2 pin of FT232R. Transmitter is enabled automatically only when a data is transmitted. Its receiver is configurable by selecting proper function for the CBUS3 pin of the FT232R chip. This is done by MPROG utility. Funcion “TXDEN” – receiver will be enabled all the time and disabled only while transmitting data so we don’t receive echo. Function “PWRON” – receiver will be enabled all the time, echo will be received all the time. Function “I/O” – receiver is disabled all the time and its RX output is set in high impedance mode so we can use other connectors on board. ATTENTION – receiver is default enabled! Differential output A and B as two goldpins, and extra terminator jumper on board. UART TTL – TxD and RxD lines in TTL standard, as goldpins, for direct connection of asynchronous transmission 0V-5V devices, like microcontrollers. RxD pin is shared with RS232 chip output which can’t switch it in high impedance mode when chip is not used (0V on RS connector). Instead, it give high state on this output preventing direct using with other transmitting devices. the easiest solution is a 10K resistor between this output and read line. FT232R will correctly read data trough that resistor, and a current needed to pull down this line will be below 1mA. eagle 5.10 project files, their PDF versions, schematic.